Pop Corn Machine | JOLLY JACKS JUMPING CASTLES! 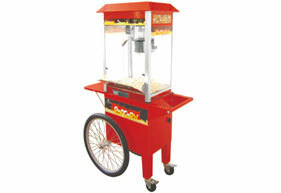 Whatever the occasion, nothing adds more class, flair and fun than a traditional movie pop corn machine. No doubt, your pop corn machine will be a huge hit with the kids, as well as with the adults, as everyone scoops in and fills their buckets with fresh, hot, flavoured and great tasting pop corn. Just like at the movies and circus. Pop corn machines are ideal for birthday parties, movie nights, themed events, corporate functions, and all sorts of events. Our pop corn machines are authentic, high-quality commercial-grade and come complete with their own authentic movie trolley-cart. FREE delivery & set-up: Jolly Jacks Jumping Castles professional staff will deliver the pop corn machine and all ingredients, whilst instructing you on how to operate the pop corn machine. Actually, it is extremely easy to operate, and lots of fun while doing it. All you need to provide is a 240 volt power outlet. Cleaning: NO CLEANING REQUIRED. Important – you do not clean the pop corn machine. Jolly Jacks Jumping Castles will pick up the machine and conduct all proper cleaning. Price: Overnight pop corn machine hire $120, all inclusive for 100 servings (oil, salt, butter flavour, corn kernels & original movie cartons).